The Seeds are in! Sam and Rachel have been busy putting them all up on the racks and it’s very inviting! Please call in and have a look, or call us to check we have what you need. (01209) 718975. 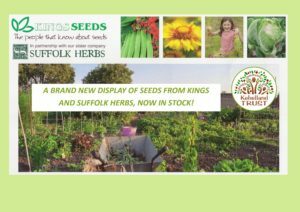 We are really delighted to say that we will start retail seed sales this year, from renowned seed supplier Kings and their partner company Suffolk Herbs. Most of our commercial crops are grown from Kings Seed and we have always been really pleased with the germination rates, value for money and high quality of their seed. We are sure you will feel the same.